If you've got a history of late payment of bills, including Credit Card ones, you'll be digging a deeper hole by missing anymore payments. 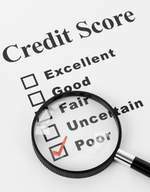 Your credit rating will deteriorate further and you'll probably have a real problem getting accepted for any new credit. However, if your bills normally always get paid on time then missing a payment every now and then will have almost no effect on your credit rating. Whenever you miss a monthly credit card payment you card will always charge a fee, usually around £12. Some people report that as long as you haven't got a history of late paying there's a good chance your card company will refund it to you. However, I'm afraid there's almost no chance that they'll remove the late payment entry on your credit file. Also See Secret 7 - Protect your credit rating with your life - which is one of this site's 10 Secrets to Good Personal Finance.